I know this is a niche product however if someone is looking for a gift for their Transformers mad child or partner then this could be it. Check out videos of this transformer on youtube, it is around 2 feet tall. I bought one from a1toys for my son for his birthday, it arrived very quickly! There are some other transformer sets on sale too. Should also mention this is the cheapest you can find this toy online at the moment! Good price for the sworded fort max. The regular one was same price before Xmas in tesco so nice to see this one same price too. It's a lot of toy for the money, voted hot. Though the 2 forms don't look very different. I much prefer the less obvious transformations, Dinobots for one. "I know this is a niche product however if someone is looking for a gift for their Transformers mad child or partner then this could be it." Plenty on here. Don't be shy that you are an actual human adult and play with toys or video games. As long as you don't entice children to play with your toys and games there is no problem. 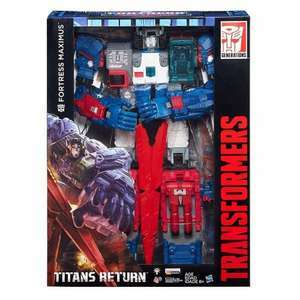 "I know this is a niche product however if someone is looking for a gift … "I know this is a niche product however if someone is looking for a gift for their Transformers mad child or partner then this could be it. "Or adult grown up man who likes playing with toys.....Plenty on here. Don't be shy that you are an actual human adult and play with toys or video games. As long as you don't entice children to play with your toys and games there is no problem.Good clean fun!! It's when you start collecting the masterpiece ones but they are amazing. Is awful, his fore arms have no resistance so flip like a spineless chicken, the legs fall off and the body has no grip to change smoothly. Where as my 1980's Sl ag, not slug is much better. I got the Grimlock Masterpiece 2 years ago after a deal on here. Looks … I got the Grimlock Masterpiece 2 years ago after a deal on here. Looks good but buildIs awful, his fore arms have no resistance so flip like a spineless chicken, the legs fall off and the body has no grip to change smoothly. Where as my 1980's Sl ag, not slug is much better.